Dr. Cravey received a Bachelor of Science degree in Biomedical Science from Texas A&M University in 1988. 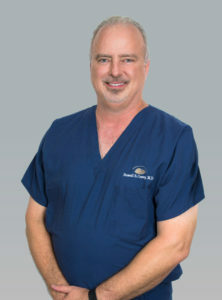 After graduating from Texas A&M College of Medicine in 1993, Dr. Cravey completed a four year Ophthalmology Residency at Scott & White Hospital and Clinic in Temple, Texas. Dr. Cravey is certified by the American Board of Ophthalmology. Prior to moving to Kerrville, Dr. Cravey served as staff ophthalmologist at Scott and White Clinic in College Station and Assistant Clinical Professor of Surgery at Texas A&M University Health Science Center. He opened his practice in Kerrville in May 1998. Dr. Cravey is a highly skilled surgeon who cares for thousands of patients with every type of dysfunction and disease of the eye, certified to use YAG and SLT lasers, maximizing his ability to offer complete care. When a patient comes in to see Dr. Cravey, he takes the time that is needed to help them understand the nature of their problem and how he is going to treat them. He answers all questions in easy-to-understand terms, making them feel at ease. By showing genuine concern for his patients and providing individualized attention, Dr. Cravey’s office offers a personalized experience that is rare to find in healthcare today.